Watching, quite like the look of the antique gold. For that price it'll certainly be interesting to know if it's any good. Is it right that the reel sides are cardboard? A material that absorbs and holds damp? Though it doesn't suffer as notably as abs or succumb to moisture related issues as quickly as abs and petg it s still susceptible. 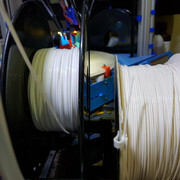 However unlike the other two that absorb the water then display symptom in the form of bubbling and popping during use Pla goes the other way and takes on a brittle like condition to a point were it'll snap incredibly easy even as its coming off the roll, like petg though a quick warming in the oven or a dehumidifier can often rescue it. In short having it on a cardboard roll is probably not a good idea but then again that's pretty much a given on any of the three mentioned filaments. In the past I used a brand that was on cardboard spools, never was a issue and I don't keep PLA sealed. Would use it now but the price went through the roof and couple of years ago so made the switch. Have you printed with it Gaz? I know this is tempting fate, but my two printers are located close to three fish tanks with high turnover filtration, ones that need fairly regular "top up" due to evaporation. I have not noticed any adverse reaction to this. While most reels are kept in their plastic bags, a few have "lost" theirs, a couple being given to me "bare" with known open reel previous storage. I hasten to add these are mostly PLA, though I do have currently seven reels of PETG, and not noticed any difference in performance. I have not as yet needed or trialled ABS. While its tempting to say this result is due to a "Prusa" level of performance, don't forget the simple little Fab II Mini that still gets used regularly and usually has a bare reel sitting on it "unprotected". I have tried three times now to buy a box for "heat box" use, but not located the size I want. Local sellers list one, but out of stock for ages, I guess other "printers" have got in before me!! I'm tending to buy various makes sold by HobbyKing, only dragged away when forced by HK not having shades needed or being OOS in UK warehouse. 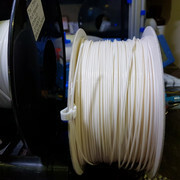 The ONLY reel that has given me any difficulty (though I still use it) is a more expensive than most brought Polymaker PolyPlus PLA in grey that is rather rigid, matt and "grainy". I'll certainly look at this range, also the Amazon UK source for Prusa filament. Oh Dear, thanks for the heads up. Is it worth sending some to a couple of us to confirm no way?? Page created in 0.126 seconds with 48 queries.